Being a people and property focussed business we recognise that our staff are central to our performance. We are a growing company with plans to build 1,000 new homes for Cornwall by 2021. Our video shows you why our staff are so passionate about the work we do. The diversity, creativity and enthusiasm of our people will determine our ability to be among the top performing companies. We have made it a positive business objective to be a 'good and respected employer' and have developed a HR Strategy to help translate that into reality. 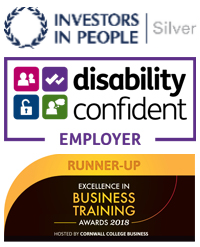 We have a strong commitment to personal development and hold the Investors in People Silver accreditation. Coastline Housing employees are entitled to at least 25 days holiday per year (depending on grade), plus eight bank holidays. Coastline Services employees are entitled to at least 23 days holiday per year (depending on grade), plus eight bank holidays. This increases to 28 days after five years service. Part time employees and employees who start part way through the leave year, receive a pro rata entitlement to holidays and bank holidays. Following the recent introduction of government legislation, new employees are auto enrolled into the defined contribution scheme administered through The Pensions Trust (for Social Housing). Coastline Housing and Coastline Services will be auto enrolled with a 2% starting contribution. Coastline will contribute 3%. Further information on this scheme can be found here: The Pensions Trust (for Social Housing). Or for further details, please contact HR. Coastline Housing operates a performance related bonus scheme, and Coastline Services provides a profit related bonus scheme. These are designed to reward individual performance and achievement, as well as Company performance. We believe in supporting the health and wellbeing of employees and after one month of employment, employees are enrolled in a healthcare cash back scheme. This scheme allows employees to claim for costs relating to dentist, opticians, a full health screen, physiotherapy, osteopathy, chiropody, podiatry, chiropractic, acupuncture, homeopathy and diagnostic consultation, tests and scans. Employees can access the 24 hour Employee Assistance Programme, which provides a confidential counselling service (both telephone and face-to-face), health advice and legal advice. On an annual basis we offer free flu vaccinations and health checks. Cycle to work scheme - enables employees to purchase a bike to use for both cycling to work and personal use on a salary sacrifice basis. This scheme is opened at various times during the year. Discounts - available for supermarkets, high street stores, theme parks & attractions and holidays. Coastline considers applications for flexible working, to support employees to achieve a good balance between work and home life commitments, where the needs of the business can still be met. We operate a flexi-time scheme which has core daily hours and enables employees to be flexible over their working hours and take time off where additional time has been worked. An Excellence Award Scheme - where employees can nominate colleagues throughout the year for outstanding performance. Ideas Factory - we encourage all employees to put forward their ideas, no matter how small, to our ‘Ideas Factory’ and if their idea is implemented they will receive a gift in vouchers. Long Service Awards - we reward long service at Coastline, with gifts awarded for long service totalling ten, 20, 30 and 40 years. We provide fantastic training opportunities, often sponsoring employees to achieve professional qualifications relating to their job role. In addition, there are opportunities to shadow other colleagues to gain an insight into other roles within the group. We provide sponsorship of up to two subscriptions to professional institutes annually. For employees with at least one year’s service, we provide enhanced maternity and paternity pay. Free tea and coffee at Coastline House. Some job roles are subject to flexi time.